Hurts to Laugh is Nashville’s gnarliest band. Under the spiritual leadership of songwriter guitarist Cliff Cobain, the group has delivered three national tours, produced four music videos, and debuts a dramatic line-up change. Only a year after releasing the acclaimed full-length “Meet You Underground”, ‘The Laugh’ are back with an emphatic nine-song declaration of dogged self-determination: “Hope It Works Out”. Honoring the band’s roots in punk rock and skateboarding, Cobain enlists bassist Stevie Ray Ramone and drummer Buddy Valens to aid in his efforts to reach a wider audience in the name of fun and spontaneity. The collaboration among new bandmates and producer Mike Purcell has strengthened the music behind Cobain’s existentialist verse and the group offers a timeless commentary on the individual’s struggle against the forces of history. 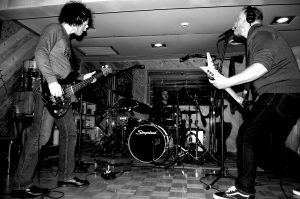 Their heavy-hitting Raga Rock single “Little While” backed with the title track “Hope It Works Out” will be released February 7, 2017 on a limited run of lathe-cut 7″ records via Velocity of Sound Records and will be featured on the soundtrack to Elvis Wilson’s award-winning independent feature film Fogg. Plans for the future include a D-stage afternoon slot at Coachella 2017, a network TV travel show, and a bid for Tennessee State Governor on the Cocktail Party ticket.